Currently the second largest man-made pit in the world. 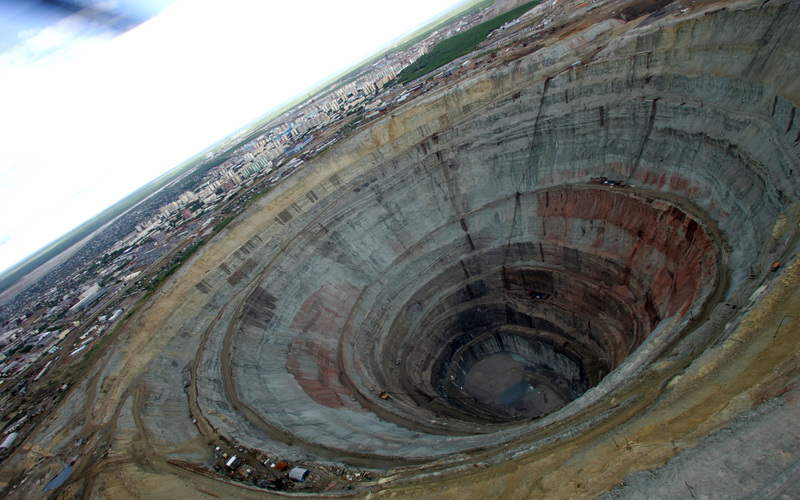 This diamond mine, located in Mirny, Russia, is so massive that it creates a downdraft strong enough to enforce a no-fly zone around it. The mine, which opened in 1957, averaged 10 million carats a year until it closed in 2011. Conditions on the site were notoriously bad. Winter temperatures dropped low enough to freeze oil and cause rubber and steel to shatter after continual use. Near the end of the mine's use it took vehicles over 2 hours to drive from the bottom of the mine up to the surface.